A control valve for the most difficult applications where high pressure drops are present, causing cavitation, noise and erosion. 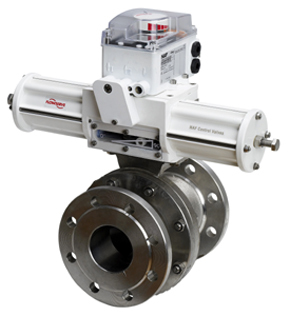 The design is based on the Flowserve NAF Duball valve. Flowserve NAF Trimball is available with two different noise and anti-cavitation trims. A-trim gives the highest noise reduction for clean medias. The ball has a large number of small zigzag channels to take the pressure drop in several steps. When the valve is opening the channels will be opened one by one and up to 45 degrees the flow is forced to pass the channels twice. Z-trim reduces noise and cavitation by taking the pressure drop in several steps. The design allows it to be used with impurities or fibres and have a self-cleaning effect. Z-trim also provides a high Cv value and an optimum control solution.